Harvard planners have introduced the design for the science and engineering complex in Allston, encompassing 586,000 square feet of new construction and repurposed space at 114 Western Avenue. 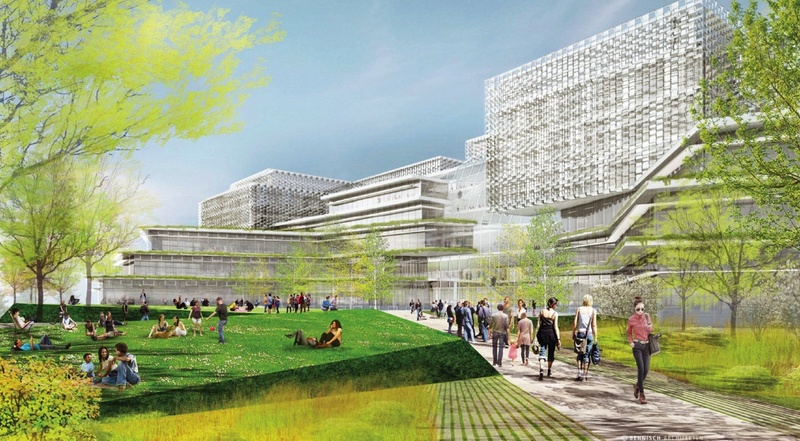 The new building will house much of the School of Engineering and Applied Sciences; a rendering of the south-facing side, shown here, shows green space—sites for future development. The center, the first academic anchor of Harvard’s expanded campus, is to begin construction next year, with occupancy scheduled in 2020. For details, see harvardmag.com/seascenter-15. At a time of heightened campus interest in diversity and inclusiveness (see “News Briefs”), and addressing sexual assault (see “Harvard’s Sexual-Assault Problem”), The Harvard Crimson reported two challenges to traditionally male campus enclaves: The Spee, a final club, extended invitations for its membership “punch” to women, an initial step in prospectively going coed, and women tried out for acting parts in the all-male Hasty Pudding Theatricals drag revue. The Pudding declined to cast any women (who have long held technical, writing, music, and support roles), at least for this year. Faculty of Arts and Sciences dean Michael D. Smith’s 2015 annual report, released in early October, highlights a troubling phenomenon, persistent since 2007, in efforts to diversify faculty ranks: a smaller percentage of eligible women than men decide to stand for tenure, departing before the scheduled review year. Tenure-track women in FAS reported lower satisfaction with faculty membership than their counterparts in any other Harvard school. Interviews with departing women uncovered “striking” dissatisfaction with departmental culture; the report stated that respondents said the culture “was not conducive to their productivity and was a significant factor in their decision to leave.” Smith has asked academic deans to review departments’ formal mentoring plans, and FAS will launch seminars and symposiums on leadership and other subjects important for tenure-track faculty members’ careers. Bright-Landry Hockey Center has expanded and renovated in recent years, with new locker rooms, sports-medicine and workout facilities, and more. This season, it’s the fans’ turn, as the rink features new, very Crimson-friendly seating. Peter Bol, vice provost for advances in learning, has combined the separate research organizations serving HarvardX, which produces online courses, and the Harvard Initiative for Learning and Teaching, which has convened faculty members and made grants to encourage innovations in classroom practice and learning assessments. The integrated research group reflects convergence in online and classroom techniques and trends, and professionalizes the scholarship of the group, which is hiring full-time research scientists. Professor of government Dustin Tingley directs the new group; he has pursued a deep interest in experiential learning in the social sciences. Professor of education Andrew Ho, who directed HarvardX research, will now chair a faculty committee advising Tingley’s staff. Harvard and MIT researchers for edX have documented the new phenomenon of cheating in online courses, as registrants use multiple identities to tease out quiz answers and then enter the correct ones in their main account. That perversion of “experiential” engagement aside, researchers from Carnegie Mellon demonstrated the teaching power of exercises (as opposed to mere watching of videos) in online courses—as in classrooms. Nobel laureate Carl Wieman, now a professor of education at Stanford, has proposed evaluating teachers (always a fuzzy art) objectively by measuring their use of practices shown to promote student outcomes, at least in the sciences. Coursera, edX’s for-profit rival, raised a $49.5-million round of new financing, and published a survey of registrants who completed courses, revealing career advancement as an even greater motivation for enrolling than general educational advancement. And Harvard Business School began offering its HBX courses for college credit through the Extension School. The University of Michigan has launched a $100-million Data Science Initiative, aiming to hire 35 new faculty members during the next four years to augment work on “big data” issues. (In a September interview with the Harvard Gazette, President Drew Faust disclosed that planning for an academic “Gateway” building in Allston may encompass “a big-data initiative [that] can be moved forward intellectually and also in terms of a physical presence there in the years to come”—near the Business School and the science and engineering complex. Units such as Harvard’s Institute for Quantitative Social Science have long been bruited about as possible candidates for that location.) Separately, the University of Wisconsin, squeezed by state budget cuts, announced that a matching-gift program had raised $250 million to endow professorships and chairs, doubling the number to 300. Curatorial cohort. Refreshing its curatorial ranks, Harvard Art Museums has made four appointments, effective this fall. Ethan Lasser is now Stebbins curator of American art and head of the division of European and American art (he joined the staff in 2012 and had been acting head since December 2014). A. Cassandra Albinson, arriving from the Yale Center for British Art, is Winthrop curator of European art. Elizabeth M. Rudy, a staff member since 2011, is now Weyerhaeuser associate curator of prints. Rachel Saunders, her Harvard dissertation just completed, is Rockefeller associate curator of Asian art. Humanities honorands. Thomas professor of history and of African and African American studies Evelyn Brooks Higginbotham has been recognized with the National Humanities Medal, conferred by President Barack Obama on September 10. Everett L. Fly, who in 1977 became the first African American to earn a master of landscape architecture degree from the Graduate School of Design, was also honored. Their work is described at harvardmag.com/fly-15. MacArthur fellows. Two professors and two alumni are among the MacArthur Foundation’s 24 fellows for 2015 (each receives $625,000 of unrestricted support): associate professor of sociology and of social studies Matthew S. Desmond (whose work on eviction and poverty was featured in “Disrupted Lives,” the January-February 2014 cover story); assistant professor of neurology Beth Stevens (cited for work on brain development); Heidi Williams, Ph.D. ’10 (a healthcare economist at MIT); and Peidong Yang, Ph.D. ’97 (an inorganic chemist at the University of California, Berkeley). Genetics giants. Mendel professor of genetics and of medicine Stephen J. Elledge and Evelyn M. Witkin of Rutgers have been awarded the Lasker Basic Medical Research Award, a preeminent honor in biomedical science, for their studies of DNA damage and responses to protect the cell. Dueling developments. As Harvard proceeds to clean the site and plan for its future “enterprise research campus” along Western Avenue and the Charles River (see “A New Era in Allston,” March-April, page 18), MIT is proceeding to add six buildings with offices, labs, housing, and stores along Main Street, and Boston Properties is pursuing rezoning for 1 million square feet of new development along Broadway. Both sites are in Kendall Square, perhaps the nation’s strongest market for biomedical and technology research space. The Harvard zone, when developed, could be a competing venue for such tenants. Soldiers field rip? Harvard Athletics has renamed Soldiers Field, the lacrosse and soccer venue, in honor of sports benefactor Gerald R. Jordan ’61, and reflagged the previous Jordan Field, home of field hockey, the Harvard Field Hockey Stadium. Left somewhat in the lurch is Soldiers Field itself, the 1890 gift from great University benefactor Henry Lee Higginson, LL.D. 1882, whose donation was “absolutely without condition of any kind,” but memorialized his friends who served during the Civil War (see “Civil Soldiers,” The College Pump, May-June 2002, page 76). The Soldiers Field name lives on, generically, for the area as a whole, and for softball games. Miscellany. Amid extensive building at Harvard (see “Campuses Under Construction,” September-October, page 16), the University’s chief for all things construction-related, Mark R. Johnson, vice president for capital planning and project management since 2010, departed in late October to join a private developer undertaking a huge project in east Cambridge.…Consumer advocate Ralph Nader, LL.B. ’58, in September opened the American Museum of Tort Law in Winsted, Connecticut, his home town.…Architect Richard Rogers has reportedly donated to the Graduate School of Design a house he co-designed in 1967 near Wimbledon as a home for his parents; it is intended as a center for advanced architecture students to stay and study when their work takes them to London.…Former School of Engineering and Applied Sciences dean Cherry A. Murray has been nominated as director of the office of science in the U.S. Department of Energy.… Robert Steven Kaplan, formerly Marshall professor of management practice and senior associate dean for external relations at Harvard Business School—a capital-campaign leadership role—has been appointed president and CEO of the Federal Reserve Bank of Dallas. He was previously vice chair of Goldman Sachs.…The Crimson reported that qualifying students enrolled in the Humanities 10 colloquium will be able to use it to fulfill their 20-level Expository Writing course, a departure from the prevailing required writing class.